These tasty bites make a great appetizer. These are perfect because you can make them ahead of time and can be served warm or at room temperature. Fresh pineapple makes a world of a difference, don’t even attempt to make these with the canned stuff. Two ingredients and a hot oven, can’t get any easier! 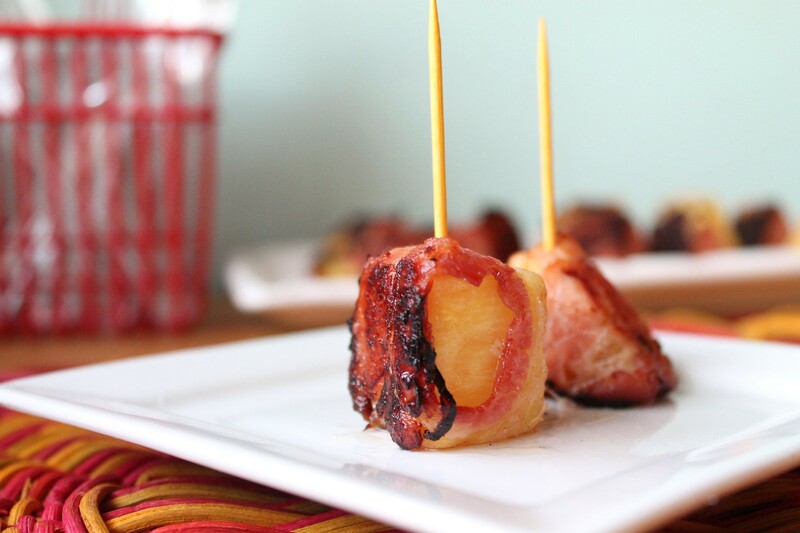 Wrap bacon around pineapple cubes. Place on a baking sheet, bacon seam side down and roast for 15-20 minutes or until bacon is crispy. *don’t have alot of time on your hands? purchase the pre-chopped fresh pineapple at your local grocery store! Hi..do you think these could be made on the grill? I a m looking for a good pizza crust . Any great ideas?